their forecast for 2017 involved 2% growth in consumption and GDP, and a substantial fall in the savings ratio. What was going on here? In August, the Bank reasoned that consumers would recognise that Brexit would lead to a significant fall in future income growth, and that they would quickly start reducing their consumption as a result. When that didn’t happen the Bank appeared to adopt something close to the opposite assumption, which is that consumers would assume that Brexit would have little impact on expected income growth. As a result, in the Bank’s February forecast, the savings ratio was expected to decline further in 2018 and 2019, as I noted here. Consumers, in this new forecast, would continually be surprised that income growth was less than they had expected. The first estimate for 2017 Q1 GDP that came out yesterday showed growth of only 0.3%, about half what the Bank had expected in February. This low growth figure appeared to be mainly down to weakness in sectors associated with consumption (although we will not get the consumption growth figure until the second GDP estimate comes out). So what is going on? There are three possible explanations. The first, which is the least likely, is that 2017 Q1 is just a blip. The second is that many more consumers are starting to realise that Brexit will indeed mean they are worse off (I noted some polling evidence suggesting that here. ), and are now adjusting their spending accordingly The third is that consumption was strong at the end of 2016 because people were buying overseas goods before prices went up as a result of the Brexit deprecation. If you have followed me so far, you can get an idea of how difficult this kind of forecasting is, and why the huge fuss the Brexiteers made about the August to February revision to the Bank’s forecast was both completely overblown and also probably premature. All Philip Hammond could manage to say about the latest disappointing growth data was how it showed that we needed ‘strong and stable’ government! I suspect, however, that we might be hearing a little less about our strong economy in the next few weeks. Of course growth could easily pick up in subsequent quarters, particularly if firms take advantage of the temporary ‘sweet spot’ created by the depreciation preceding us actually leaving the EU. Forecasts are almost always wrong. But even if this happens, what I do not think most journalists have realised yet is just how inappropriate it is to use GDP as a measure of economic health after a large depreciation. Because that depreciation makes overseas goods more expensive to buy, people in the UK can see a deterioration in their real income and therefore well being even if GDP growth is reasonable. As I pointed out here, that is why real earnings have fallen since 2010 even though we have had positive (although low) growth in real GDP per head, and as I pointed out here that is why Brexit will make the average UK citizen worse off even if GDP growth does not decline. If it does decline, that just makes things worse. Why do you assume that? My first guess would be that this implies a credit expansion. Banks lending more. And this can go on for a time, until the bubble bursts. I think you answered your own question. But consumers will only run down savings or borrow more for a reason: they think they can afford to. I was wondering about this too. In principle couldn't it also just be a reflection of increased real wages over the same period - if this push came from an increased production of consumption goods, but not capital goods? This too is obviously not so sustainable either, but wouldn't necessarily imply lower savings or higher borrowing, right? I guess this could be tested by looking at wage increases across industries. You ascribe most, if not all, of the slowdown to Brexit yet you cannot know this with any degree of certainty. We still have an economic cycle and we are overdue a slowdown anyway, Brexit or no. However, to me it has always been quite clear that the vote would affect GDP adversely, if for no other reason than the common sense one that businesses would sit on their hands until the situation became clearer and would not invest and this, in itself, would cause a slowdown. The move we have seen in GDP is little more than a partial lagged effect of that story. But if you look around at our main trading partners then growth is rather anaemic, if not positively weak, and, again, most have not been subject to an economic slowdown for some years and this must reflect back on us. 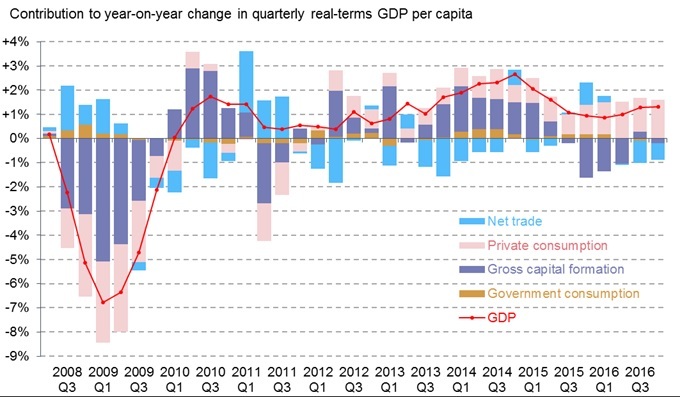 In my view Brexit was always bound to have an adverse effect on GDP in the short/medium term but to ascribe all of this change to Brexit alone is rather stretching the facts beyond what they will bear. Not really. The short term Brexit hit involved confidence and investment. That happened, but was masked by strong consumption in 2016 H2. There is nothing else that would warrant lower investment, particularly with interest rates at rock bottom. An argument against Brexit on grounds that it would cause a small AD shock as consumers correctly foresaw lower real incomes ahead, was a phony issue in that it is premised on the unwillingness of BOE to maintain aggregate demand. That turned out to be an incorrect premise fortunately for the public but unfortunately for those who wished to overturn the Brexit vote or even to minimize the damage it will do. The original 'almost recession' Treasury analysis which assumed no BoE action was questionable. But the main problem with your argument is that interest rates are already rock bottom, so there is little more the Bank can do. That is the problem with austerity. Growth in the USA was even worse (0.7 annualised). Was it also caused by Brexit? Integrating over your last two columns, my worry is that the slow down is now on its way because investment has stopped. As people realise the risk even if dimly, savings will start to build, consumption will fall further. The data from the US are less than stellar. Who knows what Trump will achieve but his tune is of reckless protectionism, this is not good news for a world economy. Trump has attacked Canada, how can anyone believe we will be getting a 'beautiful deal'. India has refused a deal unless we alter visa system. China has made clear its conditions and preference for EU deal. Our new good friend of shares values Duterte in the Philippines might oblige I suppose. So much for the BREXIT mantra of a global trading UK, this might be possible in a rapidly growing open global economy; it seems less likely with protectionist blocks and economic nationalism. After last weeks meeting between Juncker and May (which typical of UK media was hardly covered because the public don't care), it now appears we will are certain to crash out of the EU with no deal. Merkel made clear the EU27 position, but unfortunately the UK media political nexus will allow the whole thing to be presented as 'us vs the hun'. This will make it harder for anyone to offer compromise. It is stupid to think a big majority will help, May is what we she is. She is intellectually narrow with a very limited strategic vision. She so far has failed to outline any plan for BREXIT nor articulate any understanding of the issues of concern to the EU27. Its less than 2 years to go. A big majority will mean she will beat the 'us and them' drum, rally once more unto the breach, mislead with impunity with no serious parliamentary scrutiny. My great worry is we will tumble out the EU with no deal at the WORST possible economic moment. No deal would be a serious set back even in the go go times, but in a mild recession or slow down with global trade (even if not the global economy) sluggish, it will be catastrophic. There will be utter chaos and a brutal recession. This has always been my greatest fear, if we get a 5% contraction who will get blamed. As this election shows, it will be you (a saboteur), me (liberal), EU citizens (enemy agents taking our jobs) and Muslims (the modern scapegoat for all ills). I am really scared of this outcome, so much so that I become paralysed by it. I have only one hope that the EU27 will cut us some slack realising that this accident could have occurred to them to. Surprisingly, you don't mention the BoE decision in August 2016 to cut the lending rate to 0.25%, preceded and surrounded as it was by decisions of lenders across the UK to cut their interest rates as well. The month before this rate cut 13 of the better savings products were taken off the market and the availability of any product at all collapsed over 2016: " "There have been a staggering 1,128 cuts to savings deals so far this year compared with just 127 rises. Along with all these cuts, savers are also finding deals being withdrawn entirely from the market. "(Telegraph 4/8/16).